ASP8024 Heritage Edition, Analog Mixer from Audient. 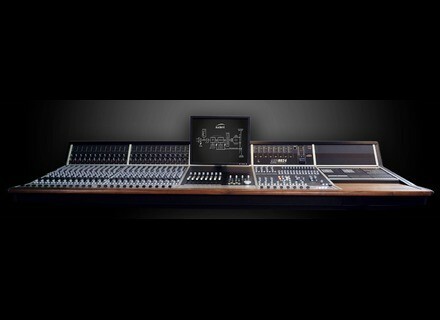 Audient anticipate on the company's 20th anniversary and present the Heritage Edition of their ASP8024 console model. The ASP8024-HE features the all new variable mix bus technology RETRO IRON, supposed to add punch and ‘vibe’ to the consoles’ mix output through circuits meant as a homage to the late 60’s American & British console technology. When engaged, the RETRO IRON output card is also said to provide subtle LOW BUMP and HIGH LIFT Mix EQ’s - inspired by classic mastering equalisers of yesteryear - these can be switched individually, allowing for wider, more spacious mix bus tones. The main mix bus has also been upgraded with JOHN HARDY CO. 990C discrete amplifiers as standard for superior and even quieter, muscular performance. The classic VCA mix bus compressor is said to feature smoother make-up gain circuitry, including a slick new gain reduction meter and a high pass filter in the compressor’s sidechain: BASS EXPAND. Audient also claims to pride itself in listening and responding to customer feedback, which they say has been the case while conceiving this model with the addition of a monitoring grade headphone amplifier, latching footswitch triggers for remote hands-free talkback, ALPS Blue Velvet main monitor pot with custom aluminium knob for that solid “everyday” feel, an improved FaderLinkTM plug-in (now 64-bit AAX, AU & VST compatible) controlling 8 channels of patchable DAW integrated VCA automation for the Dual Layer Control (DLC) module, and an improved, quieter power supply. The ASP8024-HE still retains all the familiar hallmarks of its predecessor including fully featured in-line architecture, intuitive design; flexible four-band EQ, Class-A mic preamps (used across the entire product range), comprehensive monitor control and a range of modular options including DLC, integrated 24 / 36 / 48-ch Patchbays or Producers’ Desks. The ASP8024-HE is expected to ship shortly. Price for the 24-channel version is announced at a RRP of £17,100 ($32,800 US MAP). More to be seen at audient.com, and even more for sure at the Musikmesse, Hall 9.1, booth C25/29. [MUSIKMESSE] Drawmer MPA-90 poweramp Drawmer is to introduce the MPA-90, a class-D stereo poweramp. [MUSIKMESSE] Sennheiser's MK4 goes Digital Sennheiser is to introduce a Digital version of its condenser microphone MK 4 at the MusikMesse. [MUSIKMESSE] Drawmer to introduce MC3.1 Drawmer extends its Monitor Controller range with the MC3.1 which brings an expanded feature set over the MC2.1.